Our adoption as sons of God springs from the pages of the New Testament (NT). In detailing the great gifts that we have in Christ, Paul immediately mentions that God is our “Father” (Eph. 1:3), and quickly tells us how we have “adoption as sons… according to the kind intention of his will” (Eph. 1:5). For Paul, these blessings were at the top of the list. In his biography of Jesus’ life, John’s central thesis statement is that we can become “children of God” (Jn. 1:12-13). Elsewhere, John can hardly contain himself when writing about being a child of God: “How great is the love the Father has lavished on us, that we should be called children of God! And that is what we are!” (1 Jn. 3:1 NIV) The term “how great” (potapēn) literally means “of what country.” In other words, this was an “alien” or “supernatural” type of love. This idiom “always implied astonishment.” John almost couldn’t believe we would have so high of a privilege. Feminist scholars often object to the fact that God calls us “sons.” Why doesn’t God refer to us as “sons” and “daughters” instead? First, God does refer to women as his “daughters” (2 Cor. 6:18). Furthermore, the NT also uses the gender neutral language of calling all believers “children of God” (Jn. 1:12). Second, purely gender neutral language didn’t exist during this time. The first-century wasn’t a time of political correctness. When the Bible uses the terms “man” or “men,” it is often referring to all of humankind (or “mankind”). Paul writes that God “desires all men to be saved” (1 Tim. 2:4). Surely he is using the word “men” to refer to all of humankind! Likewise, in Acts 17:34, Luke records that “some men joined [Paul] and believed…” And he goes on to write than one of these “men” was a “woman named Damaris.” This literary convention was used even up until recent times. Recall Neil Armstrong’s famous statement, “That’s one small step for man… One giant leap for mankind.” Previous generations saw nothing chauvinistic about speaking this way—even if postmodern people are more sensitive to this. Third, in the first-century, only the sons of the family inherited the estate—not the daughters. By calling both men and women “sons,” the NT authors were elevating women to equal status (Gal. 3:26-29; cf. 2 Cor. 6:18). Far from devaluing women, this concept elevates their value to equals in their inheritance. We are not a son in the way that Jesus is the “Son of God.” Jesus is God’s Son by nature. We are God’s sons by adoption. But what does it mean for us to be adopted? Under Roman law, an adopted son enjoyed the same status and privileges as a real son. A well-to-do but childless adult who wanted an heir would adopt a male, usually at an age other than in infancy and frequently a slave, to be his son. The reason for adopting, in the first-century world, was specifically to have an heir to whom one could bequeath one’s goods. In the Roman world of the first century AD an adopted son was a son deliberately chosen by his adoptive father to perpetuate his name and inherit his estate; he was no whit inferior in status to a son born in the ordinary course of nature, and might well enjoy the father’s affection more fully and reproduce the father’s character more worthily. Jesus will rightfully inherit the world and everything in it. He said, “The Father loves the Son and has given all things into His hand” (Jn. 3:35). Shockingly, believers will have an inheritance right along with him (1 Pet. 1:4). Jesus prayed, “The glory which You have given Me I have given to them” (Jn. 17:22; cf. 1 Cor. 2:7). We find the Aramaic term (Abba) in only three places: Romans 8:15, Mark 14:36, and Galatians 4:6. What does this term mean? The Talmud tells us that when a little child is weaned, “it learns to say abba and imma” (Berakoth, 40a; Sanhedrin, 70b). In virtually every recorded prayer on Earth, Jesus addressed God as “Father,” shocking the religious authorities around him (Jn. 5:18). Furthermore, Jesus taught his disciples to address God as their Father too (Mt. 6:9). [Abba] is almost never used, however, in relation to God. Jewish usage shows how this Father-child relationship to God far surpasses any possibilities of intimacy assumed in Judaism, introducing indeed something which is wholly new. No one would deny that in one sense the title of ‘father for God is as old as religion. Homer wrote of ‘Father Zeus, who rules over the gods and mortal men,’ and Aristotle explained that Homer was right because ‘paternal rule over children is like that of a king over his subjects’ and ‘Zeus is king of us all.’ In those days ‘father’ mean ‘lord,’ or ‘master,’ which is what all kings (as well as fathers) were. The important point, however, is that the address was always impersonal. In Greek thought their God could be called a ‘father’ in the same way that a king might be called a father of his country. So, too, do we call George Washington the father of our country. But the deity is never pictured as ‘my father’ or ‘our father’ in Greek writing. The uniquely Christian teaching of adoption must have stunned both Jews and Pagans alike. God carries many names and titles in the Bible: Creator, Judge, Lord, Master, Teacher, Provider, Protector, Friend, Almighty, Most High, the Ancient of Days, the Holy One of Israel, Sovereign, Shepherd, and even the self-existent “I AM.” Of all these names, why does God insist on us addressing him as Father? Why not ‘Creator’? Jesus didn’t pray, “Our Creator, who is in heaven…” He prayed, “Our Father…” (Mt. 6:9). While God truly is our Creator, he chose not to emphasize this name. After all, even the animals can relate to God in this way. Microscopic cells and molecules stand in relation to God as their Creator. He didn’t want this to be the title we used to address him. Why not ‘Judge’? If a Judge let you off the hook in a court of law, you would be grateful, but you wouldn’t necessarily feel close. You wouldn’t feel affection to that person. Why not ‘Friend’? We have intimacy with friends, but not at the level of family relationships. Moreover, our friends are all equal in authority with us, which doesn’t capture the role God wants to play in our lives. God chose the title of Father to capture the way he wants us relating with him. My three year old son affectionately calls me, “Dada.” But I’ll never forget the day he came down the basement stairs, looked me directly in the eye, and called me, “James.” I almost couldn’t believe what I was hearing! At first, it was endearing to hear him call me by my proper name, but very quickly, the novelty wore off. It wasn’t long before I told him that he couldn’t call me that anymore. God has nothing but love for his Son. Jesus said, “The Father loves the Son” (Jn. 5:20), and God loved Jesus “before the foundation of the world” (Jn. 17:24). At his baptism, God spoke these words of Jesus: “This is My beloved Son, in whom I am well-pleased” (Mt. 3:17). Because we are “in Christ,” God has the same view of us as he did of Jesus. Because we are in the “Beloved” (Eph. 1:6), Jesus isn’t “ashamed” to call us his brothers (Heb. 2:11). Can you see why Satan hates us so much? Can you see why day and night he accuses us before God (Rev. 12:10)? He can’t stand that selfish, sinful, and smelly primates like us would be the ones God would love as sons. He can’t stand that we would be the ones to inherit God’s blessings, rather than him. But how do you think Jesus will feel? We’ve been waiting several decades to meet him, but he’s been waiting eons to be with us. If we will burst into tears of joy when we see Christ, how will he react when he finally sees us? We are already God’s children (1 Jn. 3:2), but we wait to become God’s children (Rom. 8:23). Jesus promised, “I will not leave you as orphans; I will come to you” (Jn. 14:18). What will this reunion look like? What can we learn about our relationship with God by studying parent-child relationships? Think of the imagery this conjures up in our minds. Children have a natural humility. Jesus tells us that he wants us to come into the kingdom “as a child” (Mt. 18:3-4). This doesn’t refer to a child’s gullibility, but to a child’s humility (see Eph. 4:14). God wants us to grow and mature as believers. He desires for us to change in many ways. But this is the one way God says he never wants to see us change! Children don’t realize how much their parents protect and provide for them. Children are exceedingly vulnerable, and cannot protect themselves from evil people. Similarly, as believers, God promises to protect us from Satan (2 Thess. 3:3; Jn. 10:28-30; Ps. 23). Children can’t provide for themselves, and don’t realize how much their parents sacrifice behind the scenes. Kids open up the fridge to eat or open up their gifts on holidays—not realizing how much their parents have sacrificed behind the scenes. Likewise, Father God provides to meet our needs in ways we can’t always see (Mt. 6:26-33). Children have shameless access to their parents. Paul writes, “We have boldness and confident access through faith” (Eph. 3:12; cf. 2:18). This is why God is always available to hear our prayers (Jn. 11:42; 1 Thess. 3:10). It isn’t the eloquence of the child that gives her permission to talk to her father; it is merely the relationship between the father and child. In the same way, even though we may stammer as we talk with Father God, he still “intercedes for us… according to the will of God” (Rom. 8:26-27). Our central problem is that we believe we love our kids more than God loves his. Jesus said, “If you, then, though you are evil, know how to give good gifts to your children, how much more will your Father in heaven give good gifts to those who ask him!” (Mt. 7:9 NIV; cf. Lk. 11:11). The psalmist writes, “As a father has compassion on his children, so the Lord has compassion on those who fear him” (Ps. 103:13). Children inherit their father’s estate. As sons of God, we move around in the world knowing that we’re about to own it (Eph. 1:18; Col. 1:12). Children have a family resemblance. Just as children resemble their parents, God wants us to resemble him in this world (Jn. 5:19; Eph. 5:1). Children rarely understand their parents’ discipline. Adoption is the basis for divine discipline—what J.I. Packer calls our “painful privilege.” As children, we rarely agree with our father’s discipline, but as we mature, we quite often see this discipline from a different perspective. If we didn’t know God as our Father, it’s likely that we could misinterpret his discipline. Knowing God as our Father allows us to see his discipline in our lives as a form of love—not judgment or wrath. In the gospel of John, Jesus always refers to God as “my Father.” But after the Cross, Jesus subtly refers to his disciples as family: “I ascend to My Father and your Father, and My God and your God” (Jn. 20:17; cf. Mt. 28:10). This fits with John’s thesis statement that we need to receive Christ in order to be given the right to be called children of God (Jn. 1:12). Truly I say to you, there is no one who has left house or brothers or sisters or mother or father or children or farms, for My sake and for the gospel’s sake, 30 but that he will receive a hundred times as much now in the present age, houses and brothers and sisters and mothers and children and farms, along with persecutions; and in the age to come, eternal life (Mk. 10:29-30). Timothy didn’t have a good father (Acts 16:1). Could this be why Paul always refers to him as his “son” (1 Cor. 4:17; 1 Tim. 1:2; 1:18; 2 Tim. 1:2; 2:1)? The apostles often referred to their Christian friends as their “children” (Titus 1:4; Phile. 10; 1 Cor. 4:14; Gal. 4:19; Phil. 2:22; 1 Pet. 5:13; 3 John 4). Of course, this doesn’t refer to a parent’s authority over the child. (The apostles did not treat other adults as children.) Instead, this no doubt refers to a parent’s love and concern for their children. What did it cost God to make us his sons? It cost him His Son. How do we connect with God as our Father? Assess the primary way you relate to God. Paul taught the Galatians to stop relating to God as slaves, and start relating to him as sons (Gal. 4:1-10). Then he followed up this teaching with the provocative question: “What has happened to all your joy?” (Gal. 4:15 NIV) Paul wrote these words 2,000 years ago, but they speak to us today. You might ask yourself why your Christian life has become so sterile and unfulfilling. Could it be because you have stopped relating to God as his child? Do you relate to God primarily as a soldier or as a son? 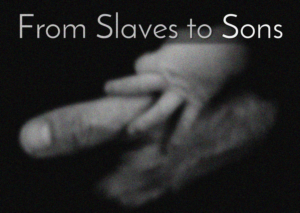 As a slave or as a son? As an orphan or as a son? Release bitterness that you have toward your earthly father. Many of us could be rejecting the love of our Heavenly Father, because we are still nursing bitterness toward our earthly one. In his book The Faith of the Fatherless (1999), Psychologist Paul Vitz has shown that many first-generation atheists had abusive, absent, or passive fathers. This psychological discovery applies to all people, including Christians. Many Christians picture their father’s face whenever they think about God. Was your father disengaged? Absentee? Abusive? Authoritarian? We need to have our minds transformed to see God as he reveals himself in Scripture, rather than projecting our fallen fathers in his place. Mediate on key passages about God’s fatherhood. While interpretation is important, so is meditation. Eastern meditation consists of emptying one’s mind, but biblical mediation is based on filling one’s mind with God’s word (Ps. 1:2). When we meditate on God’s word, we consider what he says, memorize it, ponder it, discuss it, and repeat. This has been compared to a cow ruminating on some grass: the cow bites the grass, chews it, and swallows it. But then it regurgitates the grass back into his mouth, chewing on it some more. While this is a particularly gross illustration (! ), it is similar to Christian meditation. As we read Scripture on the fatherhood of God, we need to squeeze every drop of wisdom out of the passage we’re pondering. We need to pray for God to bring this emotion into our lives with him. While we cry out to God in Romans 8, elsewhere Paul writes that the Holy Spirit cries out for us (Gal. 4:6). This must mean that we need the Holy Spirit to reveal the love of God to us. After all, Paul writes, “The love of God has been poured out within our hearts through the Holy Spirit who was given to us” (Rom. 5:5). Pray that God would open up your eyes to see “the riches of his glorious inheritance” (Eph. 1:18 NIV). J.I. Packer, Knowing God (Downers Grove, IL: InterVarsity Press, 1993), Chapter 19: Sons of God. Wayne Grudem, Systematic Theology: An Introduction to Biblical Doctrine (Grand Rapids, MI: Zondervan, 1994), Chapter 37: Adoption. Jack Miller’s audio lectures on “Sonship.” The Sonship Manual looks like it is based on the lectures of Jack Miller, who founded “Serge” (i.e. the World Harvest Mission). I haven’t read this book, but I listened through Miller’s lectures which are excellent. John Stott, The Letters of John: An Introduction and Commentary (Vol. 19, Downers Grove, IL: InterVarsity Press, 1988), 122. J.I. Packer, Knowing God (Downers Grove, IL: InterVarsity Press, 1993), 226. J.I. Packer, Knowing God (Downers Grove, IL: InterVarsity Press, 1993), 232. Wayne Grudem, Systematic Theology: An Introduction to Biblical Doctrine (Grand Rapids, MI: Zondervan, 1994), 739. Francis Lyall writes, “As a legal form [adoption] was unknown to the Jews. No Jewish legal writing contains any provisions which can be construed as adoption, and the human examples which we have in the OT can be explained without resort to the concept.” Francis Lyall, “Roman Law in the Writings of Paul: Adoption.” Journal of Biblical Literature, Vol. 88, No. 4 (Dec., 1969), 459. A. S. Wood, Ephesians. In F. E. Gaebelein (Ed. ), The Expositor’s Bible Commentary: Ephesians through Philemon (Vol. 11, Grand Rapids, MI: Zondervan Publishing House, 1981), 24. A. T. Lincoln, Ephesians (Vol. 42, Dallas: Word, Incorporated, 1990), 25. J.I. Packer, Knowing God (Downers Grove, IL: InterVarsity Press, 1993), 245. F. F. Bruce, Romans: an introduction and commentary (Vol. 6, Downers Grove, IL: InterVarsity Press, 1985), 167. John McWhorter, “Why ‘Mom’ and ‘Dad’ Sound So Similar in So Many Languages: The story of a strange linguistic coincidence.” The Atlantic (Oct. 12, 2015). Chrysostom, Theodor of Mopsuestia, and Theodore of Cyrrhus held this view. James Boice, Romans: Volume 2 (Grand Rapids, MI: Baker, 1992), 841. Arndt, Danker, & Bauer, A Greek-English lexicon of the New Testament and other early Christian literature (3rd ed., Chicago: University of Chicago Press, 2000), 1. Joachim Jeremias in Expository Times, vol. LXXI, February 1960, p. 144. John Stott, The Letters of John: An Introduction and Commentary (Vol. 19, Downers Grove, IL: InterVarsity Press, 1988), 233. James Boice, Romans: Volume 2 (Grand Rapids, MI: Baker, 1992), 841. James Boice, Romans: Volume 2 (Grand Rapids, MI: Baker, 1992), 841-842. Gerhard Kittel, Theological dictionary of the New Testament (electronic ed., Vol. 1, Grand Rapids, MI: Eerdmans), 5. Gerhard Kittel, Theological dictionary of the New Testament (electronic ed., Vol. 1, Grand Rapids, MI: Eerdmans), 6. James Boice, Romans: Volume 2 (Grand Rapids, MI: Baker, 1992), 842. Arndt, Danker, & Bauer, A Greek-English lexicon of the New Testament and other early Christian literature (3rd ed., Chicago: University of Chicago Press, 2000), 563. James Dunn, Romans 1–8 (Vol. 38A, Dallas: Word, Incorporated, 1998), 453. J.I. Packer, Knowing God (Downers Grove, IL: InterVarsity Press, 1993), 254.